Sit on the back deck and enjoy views of the Shoshone River and Heart Mountain. Take a stroll to downtown Cody for shopping and dining. This one bedroom apartment is the perfect combination of town and country. With a full kitchen and washer and dryer you'll have everything you need for a 2 night or two week stay! The home features woodland decor and comfortable furnishings. There is a queen bed in the bedroom and a queen sofa sleeper in the living area, a full bath and another half bath make it the perfect set up for a small family or group of friends. 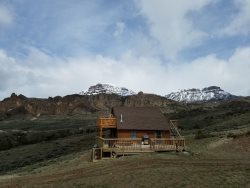 River's View is available year round - so when you want to escape and take in some fresh mountain air and wonderful scenery - let us reserve this small place of relaxation with all the comforts of home for you. This property could not be booked online, so I worked with Sandi, who was very helpful and responsive. Everything was great, and the River's View apartment was a nice home away from home during our visit to Yellowstone National Park. Our compliments to the owners for creating a comfortable and charming apartment. Everything was neat and immaculate and well supplied. All were helpful and friendly. This property was spacious and so quiet. Very clean and well maintained. Nightly rates are based on an occupancy of 2, there is an additional fee of $10 per person for the 3rd and 4th guest.